Expressing one’s emotions, or rather any emotion, is exactly the definition of art; through images, paintings, words, or sculptures, one can bring back a certain emotion, and remind us of things that we’ve lost along the way. Mai Abdullah has done that in her project, Teatro. Graduating from the Faculty of Fine Arts, Minia University, Abdullah has made her way as an artist and sculptor, with a passion that grows every day. Her colleagues know her quite well for the brilliant work she brings to the world, and she’s back again this time with a bang. Photos of her latest artworks have been circulating around social media, gaining unanimous acclaim for her meticulously detailed sculptures, as well as the feelings they bring along. We bet you’ve seen these pictures around social media, but here are some of our favourites to jog your memory. If you’re impressed by the statues just from photographs, wait till you see it face-to-face. Abdullah has just opened her exhibition entitled Teatro at Gallery Misr, in Zamalek, which will run till the 13th of January, so you have more than enough of a chance to head there. 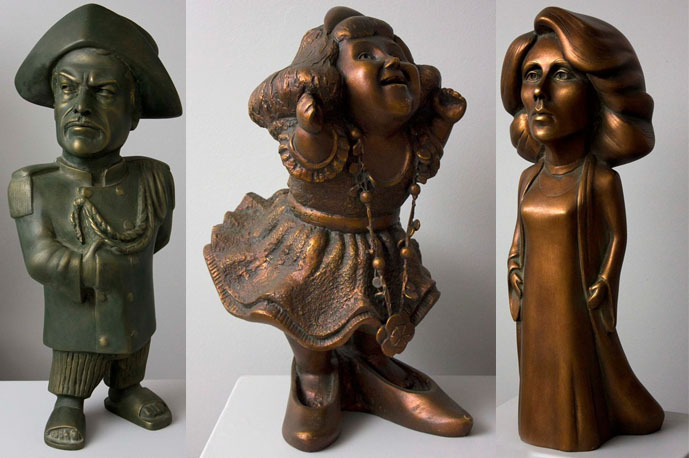 The exhibition features over 22 statues of celebrities from the golden age and more modern times; singers such as Umm Kulthum and Abdel Halim Hafez, as well as iconic actors, such as Soaad Hosny, Omar El-Sherif, and Samir Ghanem as Fatoota. You can see more pictures of her work on her Facebook Page, or better yet, go to Gallery Misr in Zamalek to see her beautiful works face-to-face.